Once you see our Patriots Jet Team in action, it’s hard not to wonder a little about the amazing aircraft that make it all possible. After all, our pilots’ skills and flying talents would be useless if they didn’t have jets capable of performing these amazing acts. When he began dreaming about our team, PJT owner Randy Howell knew that he needed to find a jet that was fast, maneuverable, safe and affordable. As a former United Airlines pilot and forever jet enthusiast, Randy has extensive aviation knowledge and began researching jets that would meet all these requirements. Eventually, he settled on the L-39C. Designed and manufactured in Eastern Europe, the L-39C Albatros is a sleek jet that serves primarily as an advanced flight trainer for new military pilots with the student pilot in the front cockpit and the instructor in the slightly higher rear cockpit. However, with the necessary upgrades, it has also been used in combat for missions such as reconnaissance and ground attack. The L-39C characteristics have proven to be both advantageous and a challenge for our operation. Even though the L-39C is not as fast as a modern combat fighter, we obtain speeds close to 450mph for several of our maneuvers. We also take advantage of its solid slow-speed handling characteristics hitting speeds less than 100mph at the top of our 6-ship loop and taking the jet down to 0 speed for our unique tail-slide maneuver… a maneuver you won’t see any other jet team perform. These slower speeds coupled with a very tight turning radius and a +8/-4 G range allow us to fly our maneuvers without ever leaving easy view of the air show spectators. Slower speeds on some of our non-aerobatic maneuvers, such as our opposing passes, also allow us to actually fly closer to the spectators. Most of the maneuvers of the military jet teams are restricted to 1,500ft away from the crowd because of their speed. The PJT, on the other hand, uses our speed deficit to our advantage by flying many of our maneuvers only 500ft away. This can make a relatively small jet look much larger! What many people don’t realize is that the L-39C is also a very challenging jet to fly in close formation. With experience in fighters such as the A-10, F-14, F-15, F-16 and F/A-18 as former Thunderbirds, Blue Angels and Snowbirds, our pilots are not new to formation flying. But the turbofan engine of the L-39C is plagued by what is known by pilots as a long lag time. Specifically, engine response lags throttle movement. So, for example, when a wingman is too far aft in formation and needs to accelerate to get back into formation, the pilot will move the throttle appropriately but the necessary thrust won’t appear for several seconds thus causing the jet to fall even further out of formation. Conversely, if the wingman is too far forward and pulls the throttle back, the thrust won’t begin to subside for a few seconds thus allowing the jet to move even further forward. To combat this, our pilots must recognize formation errors immediately and remedy with small throttle movements thus minimizing the lag. We’ve learned the hard way that a large throttle movement can easily result in a botched formation position that most often ruins the maneuver itself. Because of these and other unique capabilities, the L-39C is an extremely popular jet. In fact, over 30 military air forces around the world have used it for training or combat purposes. Its good looks also got it a starring role in the James Bond movie, “Tomorrow Never Dies”. Maybe you’ll remember how 007 ever so coolly flew an L-39C out of a terrorist zone in the opening scene and then ejected to safety? Yes, L-39Cs were the right jets for our team. The biggest problem that Randy found with them was their location. I mentioned that they were designed and manufactured in Eastern Europe, right? Well, that’s where they stay until someone buys them. In order to get our new jets to the Hangar of Dreams, Randy has to arrange for each of them to be disassembled and shipped. They travel via rail, sea and truck in a 40-foot-long shipping container all the way from Eastern Europe to California. Yes, they make quite a journey! We think they’re worth it, though, and once they arrive, we completely renovate them until they are in the best shape possible. We want them to fly at peak performance so our team of mechanics, engineers and volunteers work tirelessly until they do. After the renovation is complete, each of our jets gets a sleek new coat of black paint and shiny decals as the final step in joining the fleet of the Patriots Jet Team. We love our jets here at Patriots Jet Team Headquarters, and we are proud to share them with you on the ground and in the sky! 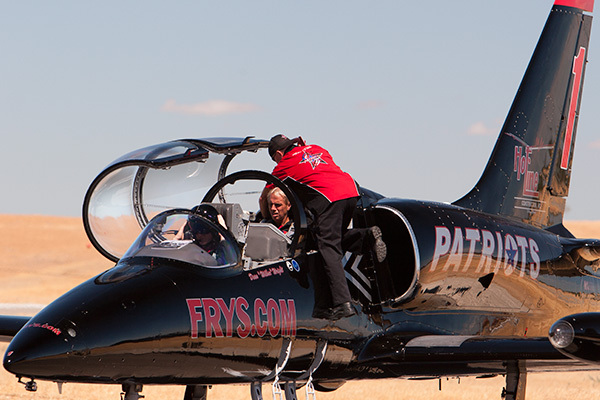 Learn more about hiring the Patriots Jet Team to fly over your next corporate event. Or, make your next event a soaring success by hosting it at the Patriots Jet Team Hangar. Contact Us.